One of the youngest ever skippers of a Windermere ‘steamer’ has made the national shortlist in a competition to find VisitEngland’s Tourism Superstar 2016. The campaign recognises the dedication and passion of those working in the tourism industry and is awarded to an individual who goes above and beyond the call of duty to ensure visitors to England have an unforgettable experience. VisitEngland has just revealed details of the national finalists for 2016, with Cumbrian boatman Rob Beale making the top ten who will go forward to a public vote. 27 year old Rob, who lives in Kendal, is the only nominee in the North West to make the shortlist. Rob started working for Windermere Lake Cruises in 2008 and is one of the youngest employees to regularly skipper an historic ‘steamer’ on England’s largest natural lake. An avid photographer of Windermere and the surrounding area, he is a keen researcher into the Lake District’s proud boating heritage and has also written three books on the history of Lakeland steamers. The Daily Mirror will host an online public vote from 16 January 2016, which shows a short film of all Tourism Superstar nominees. Readers will then be able to vote for their favourite. The winner will be announced during English Tourism Week (5-13 March 2016) and will be invited to accept their title at the VisitEngland Awards for Excellence. 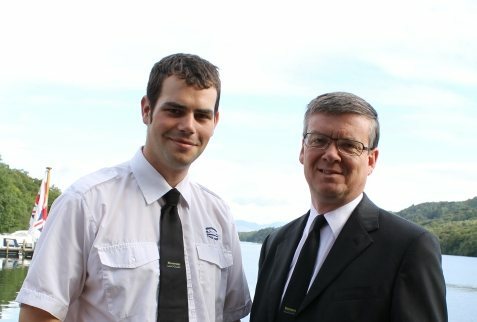 Hi res image attached: Rob Beale (left) with Nigel Wilkinson, MD of Windermere Lake Cruises.